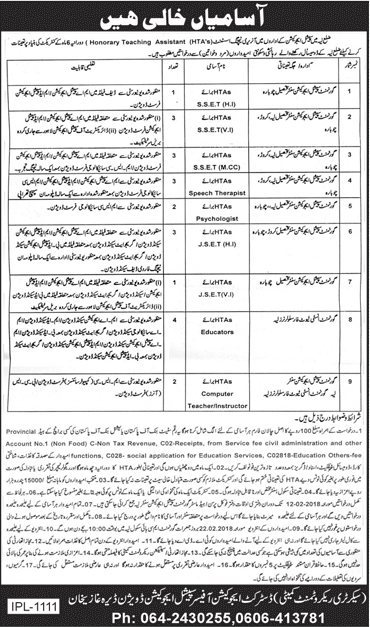 Government of the Punjab, Special Education Division D.G Khan has announced 22 New Government Jobs for District Education Authority Layyah 26 January 2018 Daily Jang Newspaper. Interested Candidates who have required qualification and experience may apply for these latest government jobs in Pakistan By sending their application to the office of Head Master Special Education Center Layyah. Vacant Posts are in different Schools of special Education Branches of District Layyah, and job Title is Honorary Teaching Assistant (HTA’s) for S.S.E.T, Speech Therapist, Psychologist, S.E.T, Educators and Computer Instructor, all jobs are on contract basis for the period of 06 Monty tenure only. And only District Layyah Domicile candidates are applicable to apply for these posts.